The Combined Heat and Power (CHP) generating system at Chadderton Wellbeing Centre has achieved the CHPQA quality mark. This sought after award confirms that the system achieves the standards required for accreditation and recognition under the Renewable Fuel Obligations certification programme, and shows how the energy efficiency of the system has surpassed the relevant national standard. 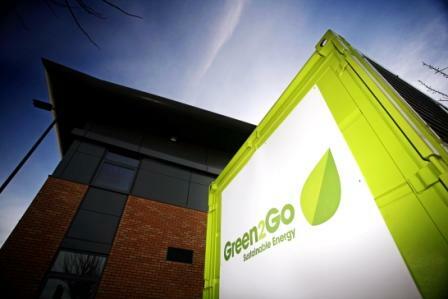 The generating system, supplied by Green2Go, is fuelled by a bio-mass fuel based 100% on waste used cooking oil which would otherwise end up in land fill and provides a minimum of 70% of the building’s electricity and heat requirements. The use of this technology results in approximately 90% carbon reduction for the Centre. The generating system is also synchronised with the National Grid which will allow it to export electricity via the Grid during periods of low demand at the centre to other sites. This allows the carbon saving of both the host site and the premises who receive the green power to be maximised. All of the Green2Go generators installed in Community 1st Oldham facilities have now achieved this quality mark, recognising Community 1st Oldham’s commitment to sustainability in all our developments.